Throughout Italy, the waning days of September signal la vendemmia, the grape harvest, and in Tuscany the event is part of a well-rooted cultural tradition celebrated by Tuscan wine-growers, resident wine-lovers and visiting aficionados alike. Vintners assess with a mystical sixth sense the critical balance of sugar and acidity in their ripening grapes, and at a moment divined only by them they initiate the harvest. Early on the chosen morning, vineyards teem with people picking grapes by hand, filling small containers and offloading them onto large wagons pulled by tractors that will deliver the precious yield to the local winery. Of course the star player in this ritual is the Sangiovese red varietal grape and its clones, which account for some 10 percent of all the vines in Italy. Sangiovese is the principal red of Tuscany and it is the main ingredient behind such labels such as Chianti Classico, Brunello di Montalcino, Vino Nobile di Montepulciano, and Morellino, as well as a number of Super Tuscan Blends including Sassacaia, Tignanello Vignorello and Ornellaia. From your autumn villa in Chianti Tuscany you can visit a local agriturismo and partake in an actual grape harvest on a working farm. Or, if your penchant is more along the lines of pageantry and consumption, join one of the great seasonal wine festivals, or sagre, held throughout Tuscany in places like Greve, Livorno, Pisa, Arezzo, Siena, Florence, Rassegna del Chianti Classico, Rufina and particularly Impruneta, where wine-tasting booths are interspersed with mouth-watering spreads of food, demonstrations by local artisans and parades with elaborate floats. 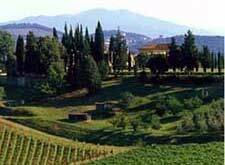 For a listing of wine-related events in Tuscany and descriptions of the region's principal labels take a look at the Aolmaia Tuscany Society website at aolmaia.com.